The doctor responsible for one third of vaccine exemptions in the San Diego Unified School District fired back Thursday at critics who say her science isn’t sound. SAN DIEGO (KGTV) - The doctor responsible for one third of vaccine exemptions in the San Diego Unified School District fired back Thursday at critics who say her science isn’t sound. Dr. Tara Zandvliet has a refrigerator full of vaccines at her office in South Park. She administers them to her young patients, but she also writes medical exemptions for some children. “It’s the kids that are sensitive that you need to just take a little bit different tack with,” said Zandvliet. Zandvliet wrote exemptions for 162 of the 487 children who provided SDUSD with a medical reason to avoid the vaccines required for entry. Despite the number, Zandvliet says she does not consider herself anti-vaccine. “I’m not gonna write a medical exemption just cause someone wants it. I’m not gonna write it or not write it just because the school says ‘hey we have too many of them’,” she said. Since California became one of three states to ban personal belief exemptions for vaccines, the number of medical exemptions has risen. So has the number of children being vaccinated. Zandvliet’s website says she will grant an exemption based on factors like family history of allergies or autoimmune disease, neither of which are recognized by the Centers for Disease Control as valid reasons for exemption. “I refuse 7 out of ten; the three that come in they've convinced me they have proof they've given me medical records from family members and it’s there,” Zandvliet said. Other doctors disagree with Zandvliet’s reasoning, including State Senator Richard Pan, who is also a physician. He was behind the law to get rid of the personal belief exemption and is now trying to make it harder for parents to get a medical exemption. 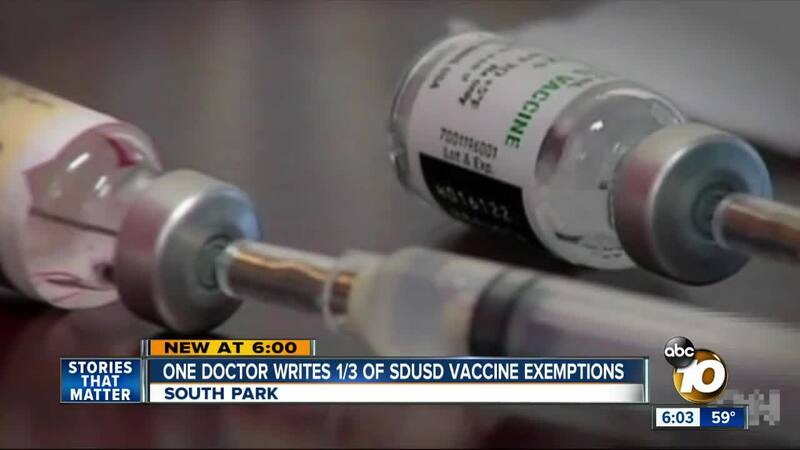 SDUSD officials say they are working with Dr. Pan and other medical organizations to address concerns about the increase of medical vaccine exemptions.